RECOVER AND RESTORE PHOTOS, VIDEOS AND AUDIO FILES . Supports a wide variety of image types: JPEG/JPG, TIFF, DNG, ARW, CR2, CRW, ERF, MRW, NEF, NRW, SRF, ORF, PEF, SR2, RW2, and RAF files. Restores photos and videos with original date-timestamp! Whether lost or deleted, recovers photos from a vast variety of storage devices including SD card, hard drive, SSD, and flash memory etc. 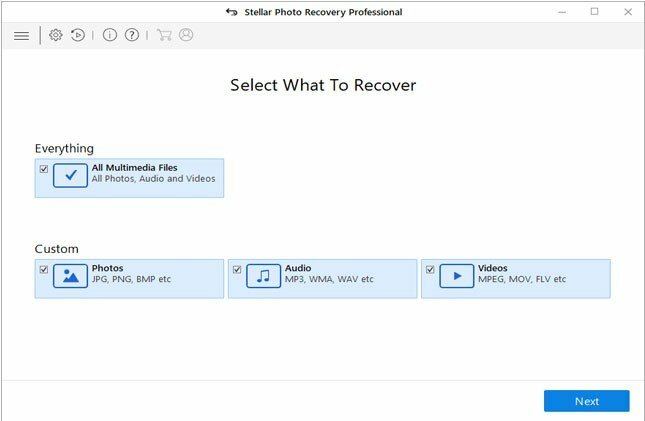 Stellar Photo Recovery Professional also restores your lost or deleted videos and audio files. Supports a wide variety of video and audio file formats and just about any storage that’s detected on Mac or Windows. Recover AND repair your corrupt photos! No need for two separate recovery tools. Stellar Photo Recovery Professional recovers photos, videos, and audio files, and repairs an unlimited number of photos and restores them to their original form. Recovers media files lost due to corrupted storage drive or device. Our Deep Scan utility enables you to perform a comprehensive scan even on your corrupted storage. Recovers photos, videos and audio files from practically any storage device, both computer devices and compatible external storage such as hard drive, SSD, fusion drive, SD card, flash memory/USB, etc. Also supports compatible storage with all camera brands, drones, smartphones. Even recovers from partially burnt or scratched media. Creates a sector-by-sector image (basically a copy) of the selected storage device before attempting recovery or repair. This image is then used to recover the media files and so eliminates any risk of further loss due to runtime drive failure. Easily recover lost photos, videos and audio files in just 3 simple clicks— Select, Scan and Recover. Our smartly built utilities within the interface — Runtime File Preview, Neat and Sortable Scan Results, Scan Now-Recover Later, and Multiple File Saving Options, make Stellar Photo Recovery Professional even easier and faster to use. See your recovered files and repaired photos before you purchase! 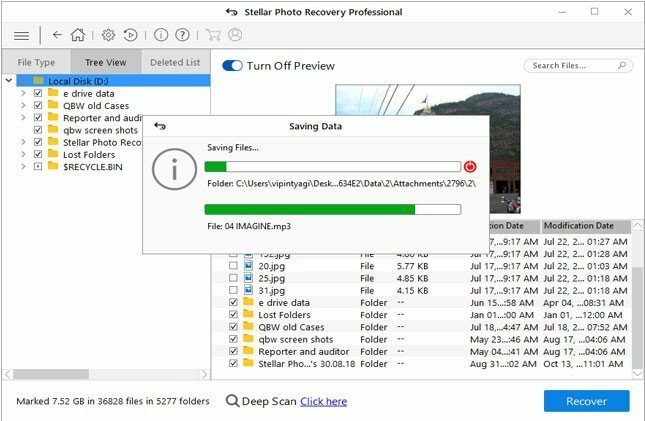 Does Stellar Photo Recovery Professional support removable storage media? Yes, the software supports recovery and repair from removable storage media. I have started Deep Scan to recover photos but the software is scanning last 24 hrs. Is it OK or what should I do? You can use the advanced settings feature and specifically filter your scan for Photos, Videos or Audio. I have recovered my deleted photos using your software but some of photos are not viewable. Photos are cut off or having blur lines. You can use the Photo Repair module of the software to repair distorted or damaged photos. Does the software retain the actual resolution of JPEG photos after repairing? Yes. It restores distorted or damaged JPEG photos without changing their original image quality format. My system does not recognize SD card. Can I recover pictures from it using Stellar Photo Recovery Professional? 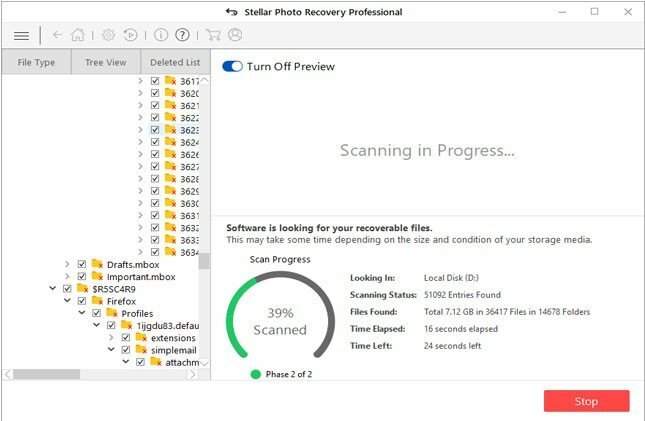 If Stellar Photo Recovery Professional software detects your SD card, you can recover the stored pictures from it. Which photo formats can I repair with Stellar Photo Recovery Professional? Stellar Photo Recovery Professional software repairs JPEG/JPG, TIFF, DNG, ARW, CR2, CRW, ERF, MRW, NEF, NRW, SRF, ORF, PEF, SR2, RW2, and RAF file extensions. 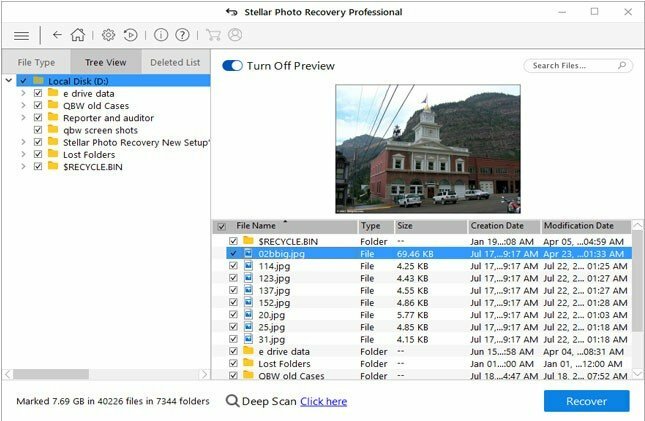 Does Stellar Photo Recovery Professional support Linux file system? 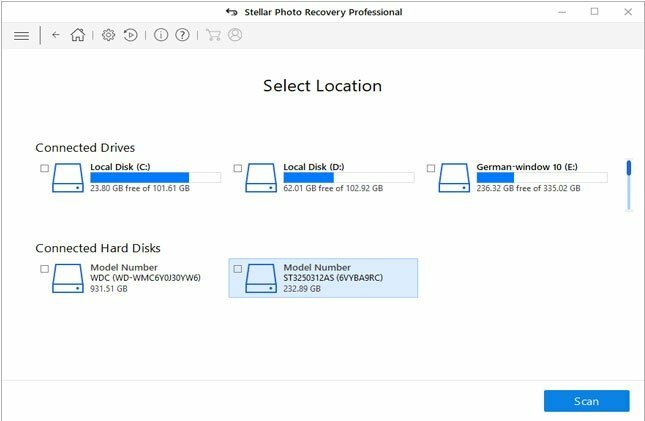 Yes, the new Stellar Photo Recovery Professional supports recovery from Linux-based drives and media. Does this software recovers deleted files from CD or DVD? Yes, Stellar Photo Recovery Professional restores deleted multimedia files from CD and DVD. Does my card needs to be connected to the system till the time of recovery? Yes. Do not remove your media during the scan, recovery or repair process. Detach your card or other media only after the recovery or repair process completes. Does the software support recovery of videos shot with drones? Yes, the Professional software recovers videos shot with drones. It can also recover CCTV, dash cam, iPad, iPhone and Android phone videos stored in SD card, CF cards, USB flash drives etc. What kind of corrupt photos can I repair using the Professional software? You can repair almost all kinds of corruptions in photos. The software fixes pixelated, grainy, broken, damaged, greyed-out, and loss of color in the photos. It also repairs image files that give some errors while opening. Does the software support my DSLR brand? 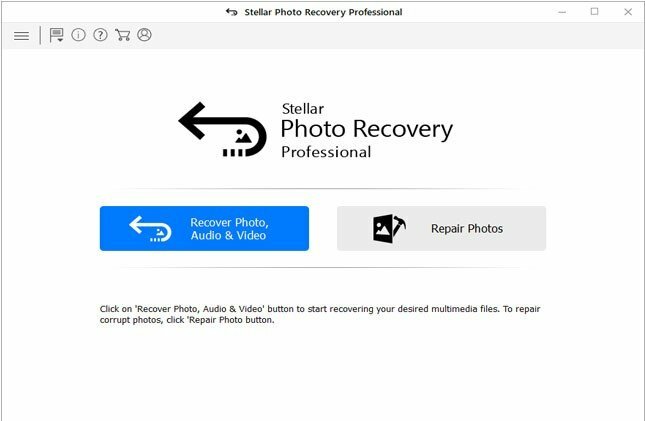 Stellar Photo Recovery Professional supports recovery and repair of JPEG and RAW photos of all popular DSLR brands such as Canon, Nikon, Sony, EPSON, Fujifilm, etc.